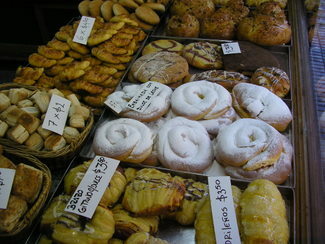 The Grand Café Savoy occupies the space along the Avenida San Martin side of the Hotel Esplendor Savoy. The interior continues the hotel’s theme harmonizing modern furnishings while maintaining an art nouveau club feel. The open dining space is sub-divided into the white-table clothed section for dinner and the café serving lunch and drinks. Very comfortable arm chairs, with coffee tables, line the windows of the café. A long dark wood bar lines the interior wall. The acoustically designed ceiling absorbs the conversations of guests and offers a changing ambient light that softly moves through shades of blues and pinks. Excellent jazz and Argentine music, both instrumental and vocal softly plays in the background. Reservations are highly recommended for dinner in the Grand cafe, even for hotel guests. We sampled all four venues on multiple occasions and were equally contented. The café menu had well prepared imaginative sandwiches and salads. A light meal for two averaged AR$100 (US$27.00). Cocktails averaged AR$15 (US$4.00) with a 2-for-1 happy hour between 7 - 9 pm. The Grand Cafe dinner menu was a superb blend of traditional Argentine grilled meats, game, fish and pasta taken to new heights with exciting presentations and not the usual accompaniments - lentils, polenta, slivered vegetable combinations and wine reductions. Dinner was not inexpensive for Argentina but well priced for the quality of the food and the ambiance. Dinner for two, with appetizer, salad and entrée, averaged AR$200 - $250 (US$53.00 - $66.00) with the wine list AR$35 on up (US$9.00 and up) from the best bodegas. The Grand Café Savoy has all the makings to become a premiere restaurant in Argentina! 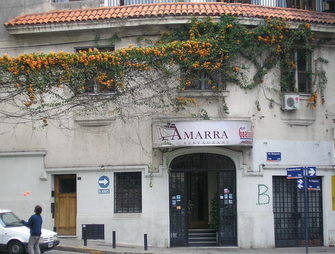 The Amarra is an attractive old vine covered house on river front Boulevard Belgrano. A respected restaurant for quite some time and based on our experience it deserves its reputation. The fairly modest sized dining room is split on two levels with soft lighting and plants. The hard stone surfaces of the floor and walls instilled atmosphere but made the noise level uncomfortable if the guests did not all speak in a soft tone - and this was on a half-filled weekday night. But the food made up for the moderate noise. Rosario’s chefs are expressive using culinary architecture and alternative flavor combinations even though traditional ingredients are utilized - beef, game, goat, lamb, and the incomparable Parana river fish. 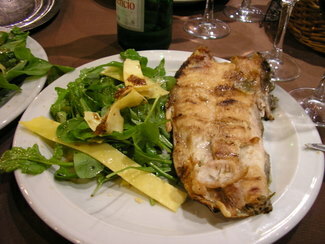 Boga is a huge white Parana fish and Amarra did not mask the meaty texture with any sauce but grilled it to perfection with a nice seasoning mix of basil, garlic and other herbs. My wife had Trucha, Patagonian river trout, grilled and served with a sauce of olives, anchovies, red peppers, walnuts and mushrooms. 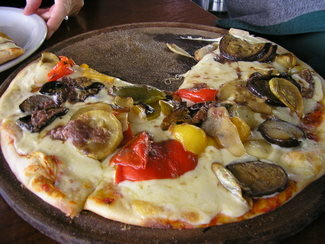 The interplay of Patagonian and Italian flavors worked beautifully. Accompaniments were crisp salads, pureed seasoned potatoes and slivered mixed vegetables with garnishes of fresh herb sprigs. The wine list was extensive and included the best bodegas in the nation. Our dinner for two, without dessert, AR$112 (US$30) with the wine list AR$22 on up (US$6.00 and up). My wife and I rarely eat dessert in restaurants but we did notice the table next to us enjoying Lemon Champ - lemon Ice cream blended with Champaign! 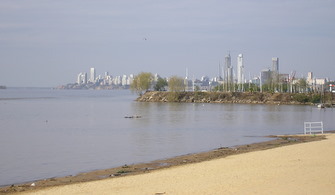 There are a number of restaurants along the Costanera, the beautiful 12-mile long river walk. Most are traditional parillas. Felini Café had several aspects that attracted my attention to eat there twice. Situated on the very edge of the cliff, Felini Café’s window walls provide a panoramic view of the Rio Parana and its islands. 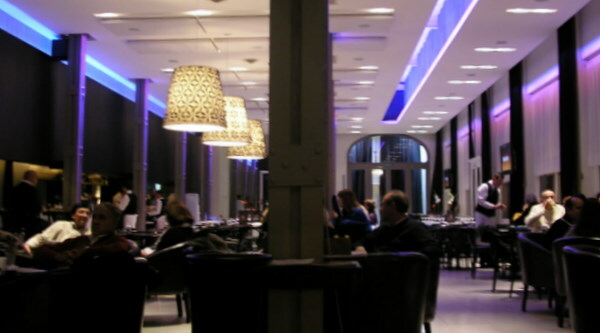 In the interior, the dining area is split on two levels giving all diners an unobstructed view. Outside is a large seating area. Even on these mid-winter days, it was packed all day in balmy upper 60-degree weather. We chose the very comfortable interior. Felini Cafe's wine list was nice including my favorite, Latitude 33 Malbec at the very fair restaurant price of AR$33 (US$9.00). Their beer list included robust artisan beers such as the incomparable Patagonia - no preservatives - at AR$15 (US$4.00) for a 24 oz bottle. Beer bottles are presented in iced wine buckets! Felini is a satisfying and scenic cafe to have a light snack, lunch or drink. Some restaurants sustain an ambiance that goes beyond simply creating a comfortable atmosphere in which to digest food. Restaurant Immigranti is an homage to the millions of people, especially Italians, that left their homelands, for whatever reason, and took great risks moving to the New World. The trattoria’s interior is lined with old photos of families first arriving after weeks in steerage. Lighting highlights the photos, not the dinners. Dominating the exposed brick wall is a wonderful black and white photo mural of early Italian immigrants. In the photo is the owner’s grandparents. 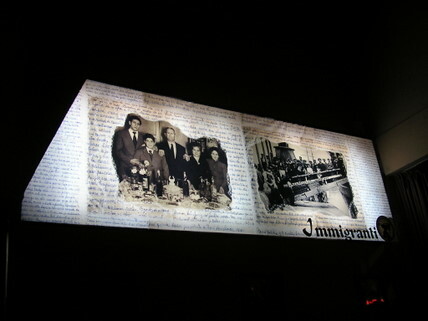 Restaurant Immigranti is also an homage to his family. Families dominated the tables that night. Whether of Spanish or Italian descent, dinner is a family affair, and the cuisine of Restaurant Immigranti is southern Italian. My first course was couscous with vegetables, influenced by the ancient ties between North Africa and southern Italy. 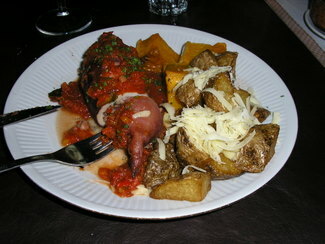 The entree was a whole octopus stuffed with a fresh, and savory, tomato-herb sauce accompanied by cheese topped roasted potatoes. The octopus was a bit tough being baked a bit too long. I would have preferred if the stuffing had been cooked ahead of time and the entire roll quickly sautéed to preserve the tenderness of the octopus. But the flavors were still excellent. My wife had a very good osco buco slowly cooked as it should be. During the evening, the owner came around to the tables and when he learned we were not locals, spent some time conversing in English, about his family and showing us a copy of Emigrantes by Shaun Tan (Editor: Barbara Fiore: www.barbara-fiore.com). It’s an evocative and tender story-without-words of immigration to North and South America. 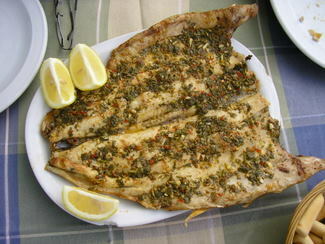 The Viejo Balcon is a well known Rosario dining establishment and despite its reputation for fine grilled meats, its specialty is Parana River fish. 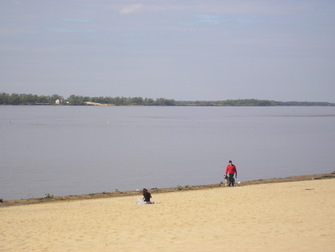 From center city a visitor needs to take a taxi because it is some distance along the north shore of the river. The interior was brightly lit but congenial, and the menu promises no more than simply prepared grilled meats and fishusing good fresh ingredients. All four of the river fish are available: Surubi, Pacu, Boga and Dorado with fresh salads and a decent wine list. Dinner for two, with wine, was AR$115 (US$31.00). Barrio La Florida, at the far northern boundary of the 12-mile Costanera - take an inexpensive city bus or a modestly priced taxi (AR$30 US$8.00) - is a fashionable beach front barrio with comfortable homes, wide sandy beaches not often found on rivers and rows of fresh vegetable and fish monger stalls - and this was winter! 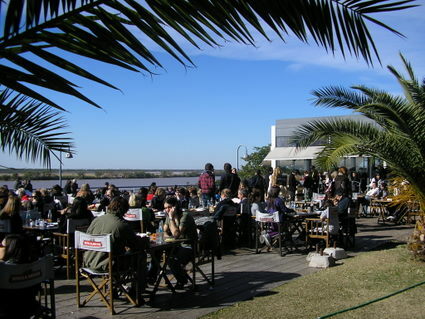 Parrilla Restaurante Escauriza is set on a cul-de-sac directly across from the river, near the ultra modern bridge that connects Santa Fey Province with the historic Entre Rios town of Victoria 30 miles east. It has an extensive covered outdoor eating area - which in the balmy 60’s (F) was very pleasant - as well as a large indoor dining room. 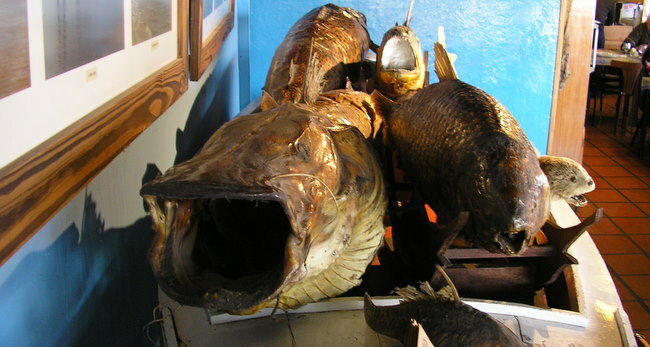 A fascinating display of stuffed Parana River fish and its other animals greet one as you entered the dining room. Parrilla Restaurante Escauriza's menu had the most extensive fish selection I’ve seen in Argentina. Of course they concentrate on the four terrific Parana River varieties - Surubi, Pacu, Boga and Dorado - which are available either grilled with seasoning rubs or smothered in the sauces Argentine’s love - a creamy blue cheese sauce is fascinating on a grilled boneless fillet! 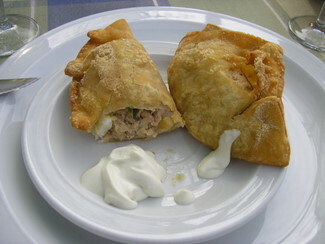 We started with their signature fish empanadas - an unusual filling for these ubiquitous Moorish/Spanish finger foods - stuffed with a combination of flaked fish, hard boiled egg, red and green peppers accompanied with a blue cheese and mayonnaise sauce. 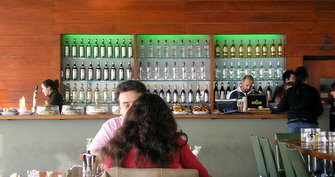 Lunch for two with wine: AR$115 (US$31.00), and the river view. 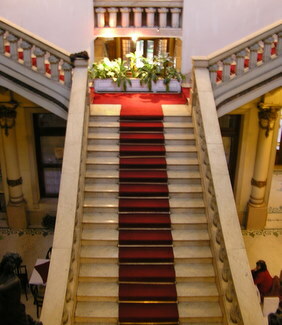 La Cibeles is located within a beautiful art deco office building/shopping mall on San Martin. We were attracted to it because of the original art work surrounding the seating areas, including a loft. 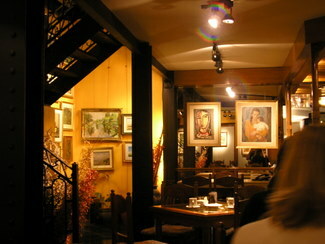 The owners have both the art gallery and café. They had exposed the original brick on the walls and the vaulted ceiling. The atmosphere was engaging. Unfortunately, the food, on this only occasion, did not live up to the surroundings. 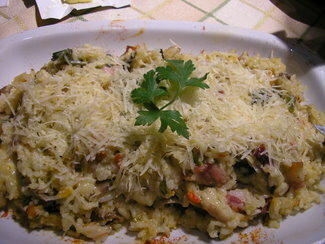 My dish of Risotto with wild mushrooms and pancetta was very pleasent, but the fat of the pancetta should have been rendered more thoroughly and blended into the risotto. My wife’s Mar del Plata Ensalada of shrimp, mussels, celery on creamy cheese rice was a good idea except they left out any seasoning altogether. Cold rice, without anything. In general, Tripache, Argentina largest bodega, produces good reliable wines, except their Malbec often tends to be harsh. Malbec should have a smooth feel on the tongue with both earthy and fruit flavors - not like a decent wine turning to premium vinegar. Tripache does have a Reserve Malbec which is superior but rarely on restaurant menus. My favorite Argentine wine is Lattitude 33 Malbec by the French Chandon winery in Mendoza. 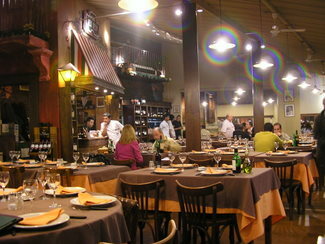 Lunch for two at La Cibeles, including wine, came to AR$70 (US$19.00). Because of the low prices and the atmosphere, I am willing to give the Café another try. A reviewer should give a restaurant three tries, but that’s difficult when traveling. (We liked a particular painting, but despite the staff leaving messages for the gallery owner, they where not present the two times we stopped back). The classic Spanish, and Italian, breakfast is a simple pick-me-up of espresso or café con leche with bread or a semi-sweet bun. But there are cafés where it is possible to get something more substantial, especially if you do not plan of eating a large 3-course lunch at 2:00 pm. At Café Flora I had one of many variations on a ham and cheese sandwich which is a popular breakfast item in Rosario. The carlitos de jamon sandwich is a grilled panni with ham, cheese, hard boiled egg and olives. That might not be a typical American breakfast, but it certainly satisfies a person who seeks out cusine that is not ordinary. Personally I like some form of protein in the morning and with espresso it was a very satisfying start to the day. At AR$13 (US$3.50) I was very happy. Calle Rioja 1052 Every Argentine city has a Club de Espana. For decades the Spanish Clubs were the center of social life and business networking for the professional class of Spanish descent. Their buildings are magnificent creations of Andalucían design with baroque and Moorish motifs both inside and in the interior, grand staircases, monumental art and rich stained glass. Many of the clubs in the past couple decades have opened the doors of their restaurants to the public. It’s a pleasant way to see grand 19th century Spanish architecture, even if the food is not of the highest quality. 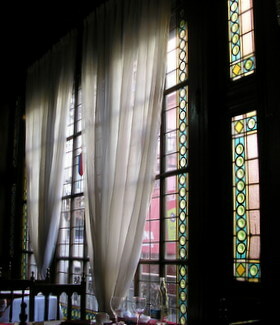 The faded dining room had soaring stained glass windows. Our waiter was friendly and attentive. After lunch he gave us a personal tour of the Club, one of many touches that make me love Argentina. 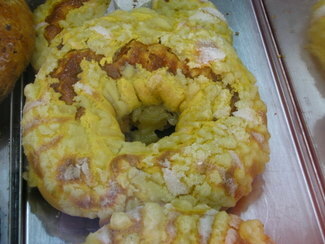 The Club de Espana’s menu was traditional Argentine fare as prepared by someone that wasn’t a trained cook. Dishes were acceptable but under seasoned. My wife had Calamari on Spanish Rice which screamed for garlic and spices. I had braised beef that was very tender but lacked any real seasoning. The entrees were accompanied by an unremarkable house salad. Go to the Club to have a budget lunch and soak in a fading atmosphere. For a livelier restaurant scene, walk down La Costanera.